The ideal machine for cocoa, pea nut butter processing and other multipurpose grinding needs with fully automatic. This Electra Premium Melanger can grind upto 100kg of cocoa bins. 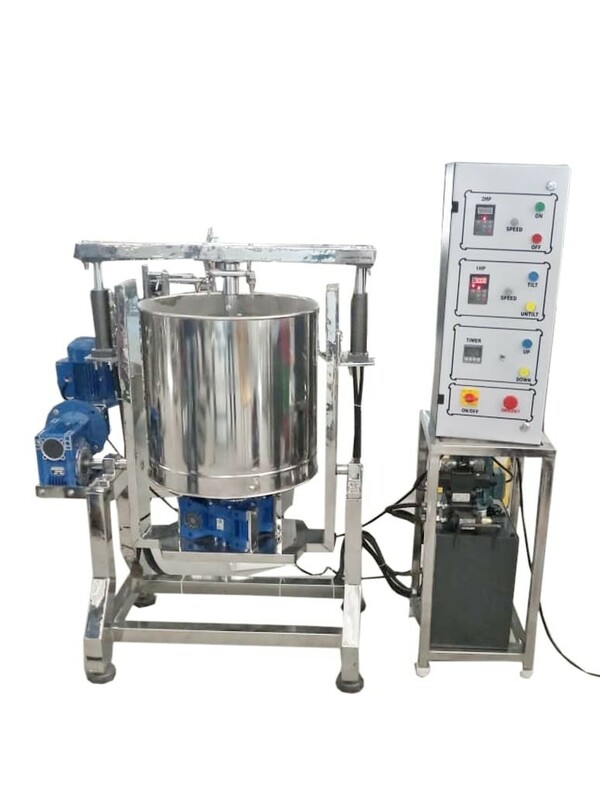 The Premium model has automatic Titling feature makes it unnecessary to have to lift the vessel or drum to pour out the contents, reduces man power and avoid straining yourself. Cleaning is a breeze, simply pour water, run the melanger for a few seconds and pour out the water. It almost cleans itself. Solid 100 % Stainless Steel body provides elegance, strength and durability. In addition, this melanger has all the features that make it stand out like powerful motor, gear drive, exhaust system, black granite stone for long life and high quality internal and external components. Tension of the granite stones can be adjusted by using Pneumatic pressure to obtain different grades of shear at different stages of grinding and for different ingredients. Double granite roller stones and only model with double scrapper that rotate over a granite base. This creates quick tremendous shear that reduces the cocoa nibs to fine chocolate liquor and nuts into paste with a particle size of the order of less than 15 microns. This amazing stone melanger grinder is the perfect companion to your endeavor. We have made several key enhancements to the grinder to make it perfect for Chocolate, nut butters, mexican masa, cosmetics and other food processing. Our stone melangers can be used to make Marcepan from almond, Mesa from corn, coconut paste, Gianduja from hazel nuts, Pistachio and cashew butters, Tahini from sesame seeds, flax seeds paste, Sphagnum moss for facials, Hummus from boiled chick peas, rice batter from rice, Quinoa and many an other grinding application. Long, trouble free operation with GEAR box and Motor directly mounted.High grade rust proof Stainless steel drum with food grade plastic components. No Plastic components in contact with food grade stainless Steel hub as a standard. Tilting feature lets you to tilt the entire unit for easy removal of contents and easy cleaningReal and naturally occurring Black Granite Stone is used to prevent chipping or thinning and long life. No artificial stones.